But the most important question – can you fit the storage and feeding into your system. Ad-lib may not work because the ‘boss’ animals get more than their fair share. Beet requires more work than other fodder crops but the rewards are huge in yield and animal performance. Fodder beet are possibly the highest yielding forage crop for UK livestock farmers. Root yields of 50-75 t/ha (20-30 t/acre) are normal and when grown really well, can exceed 100 t/ha (40 t/acre). Root dry matter differs widely depending upon growing conditions and variety from 12% for the types growing well out of the ground – Kyros, Jamon and Feldherr, to over 20% for those with similar characteristics to sugar beet – Magnum Brick & Blizzard. Roots are typically high in energy with an ME of around 12 MJ/kg but low in protein with crude protein values of 6%. Like other root feeds, their high sugar content makes them very palatable, increases total dry matter intake, stimulates rumen activity and thus contributes more to a ration than the actual analysis would suggest. This stimulation of biological protein production in the rumen is of particular relevance to organic farmers who are restricted in the amount of protein which they may buy-in. For dairy cattle, fodder beet can markedly improve milk protein content by as much as 0.5%. The crop also produces 10-20 t/ha (4-8 t/acre) of tops which in contrast to the roots contain modest energy levels with an ME of around 9 MJ/kg and higher crude protein of 15%. The two components together thus offer a very useful nutritional balance. Tops can be removed and ensiled but in practice are usually ploughed-in or grazed in situ. Where tops are to be removed, direct delivery from harvester into trailers is far better than recovery from windrows when soil contamination can be a serious problem affecting fermentation if clamped or digestibility if fed. To achieve full potential yields fodder beet needs a considerable supply of nutrients. Few soils contain sufficient amounts without large additions of fertilisers and/or manure to make up the shortfall. Potash can often be the greatest limiting element because it is needed in largest quantity and because many lighter soils, which are more suitable for late harvesting, have low potash reserves. A three year study undertaken by Kingshay Farming Trust and Duchy College Cornwall provided new data on the uptake and offtake of nutrients for fodder beet. The chart shows the uptake of key nutrients for the crops in this study where fresh root yield was between 70-90 t/ha and total dry matter yield of roots + tops ranged between 16-20 t/ha. 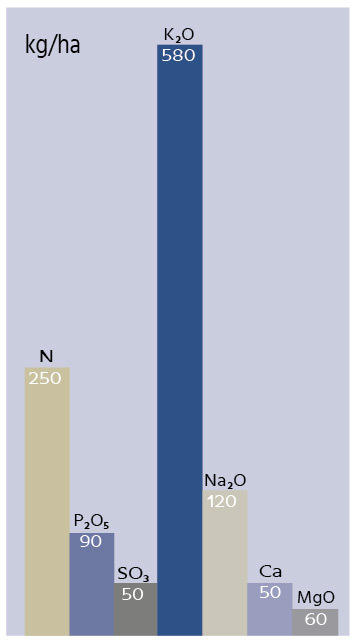 Typical sodium uptake (as Na2O) is also shown although this was not measured in this study. Availability of nutrient must be sufficient to supply crop uptake at the rate demanded by leaf and root growth. This can be very high indeed during June-August. In one two week period in this study potash uptake was measured at 18 kg/ha per day. Peak uptake is usually at the end of September. When leaves begin to die and fall off plants in the autumn, plant content decreases a little. Phosphate (P2O5) and potash (K2O) usage for fodder beet should be based on soil fertility and nutrient removal which can be calculated using typical values. Typical removal rates have been reviewed recently and amended to reflect offtake by modern fodder beet crops. Fodder beet is a deep rooted crop so soil must be well drained and subsoiled to enable the roots to explore water and nutrients throughout the profile. A good seedbed providing fine but firm conditions is essential for a good crop of beet. Lime must be applied, preferably in the preceding autumn, to ensure that pH is in the range of 6.5-8.0. Soil analysis should be undertaken to establish reserves of P, K & Mg. 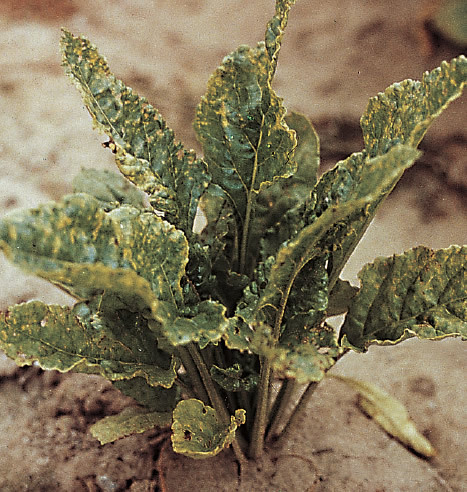 Most arable soils contain near adequate concentrations of phosphate and calcium for fodder beet. However potash, sodium and magnesium are likely to be limiting on nearly all soils so additions of fertiliser or manures are essential. As atmospheric depositions decline, sulphur will also be increasingly required. Soil analysis should be undertaken in the late summer before growing a crop of fodder beet. Satisfactory index levels are important as full yields may not be achieved where fertility is poor even using higher fertiliser rates. This is because the fresh fertiliser is not so well distributed throughout the soil. 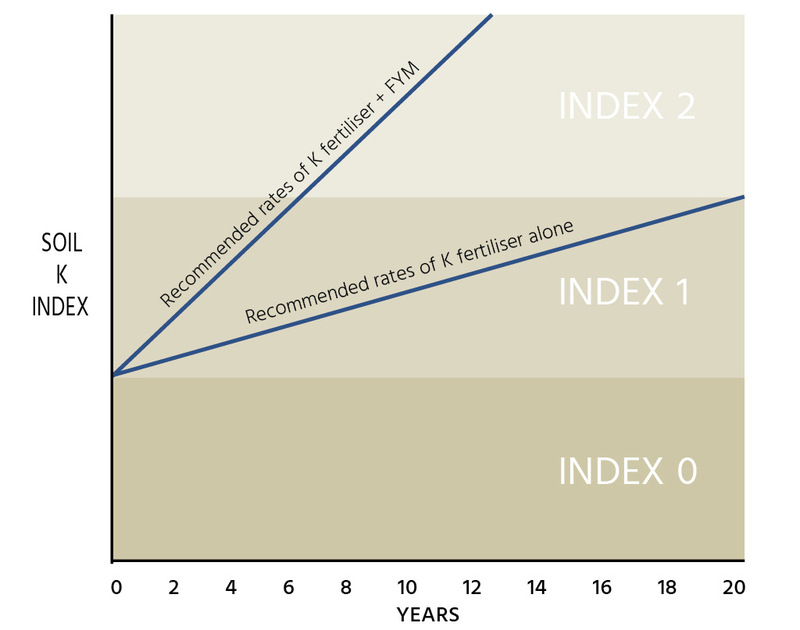 Long term experiments have shown that the aim should be to maintain fertility at index 2 by replacing the offtake in the crop by inputs from fertiliser or manure. 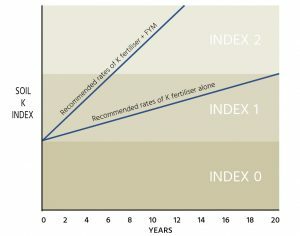 Additional nutrient in excess of offtake should be used on low index soils in order to improve fertility. This will take some time using recommended rates, depending upon soil type. To adjust the length of time it takes to build up soils, use the PDA Calculator, details of which can be found on the website at www.pda.org.uk. Fodder beet benefits from a “good start” and yields are closely related to how quickly leaf area is established. Phosphate is not needed in large quantities but is vital to root growth and plant establishment. As this nutrient is not mobile, adequate levels in the soil are very important so that young roots do not have to travel very far to find a supply. Phosphate levels on lighter soils are usually satisfactory allowing replacement dressings to be applied at any time, but at index 0 or 1, phosphate should be provided in the seedbed. This is needed in greater quantities than all other nutrients and is vital in assisting uptake of nitrogen and it’s utilisation into protein. It is also important for the formation of sugars in the leaf and their storage in the root. Potash thus affects both yield and feeding value of roots produced. 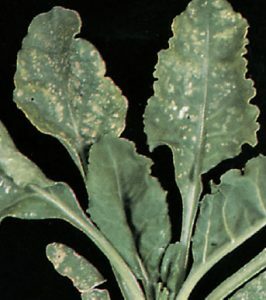 If deficiency symptoms are seen, crop loss which cannot be restored will already have occurred. Even in the absence of symptoms the crop may suffer and early wilting under dry conditions will be aggravated by inadequate potash supply. Fodder beet is derived from wild beet growing on the shores of the Mediterranean. The wild form developed the ability to take-up and utilise sodium. Modern varieties retain this characteristic and will not grow rapidly without an adequate supply (more than 40 mg/l) of sodium in the soil. Few soils except some Fen peats and silts contain this level of sodium, and light soils retain particularly low levels. Salt should therefore be treated as an essential fertiliser for this crop. Both sodium and potassium are vital for early leaf expansion in the spring to enable full use to be made of sunlight during May-July when radiation is greatest. Neither element can completely replace the function of the other. 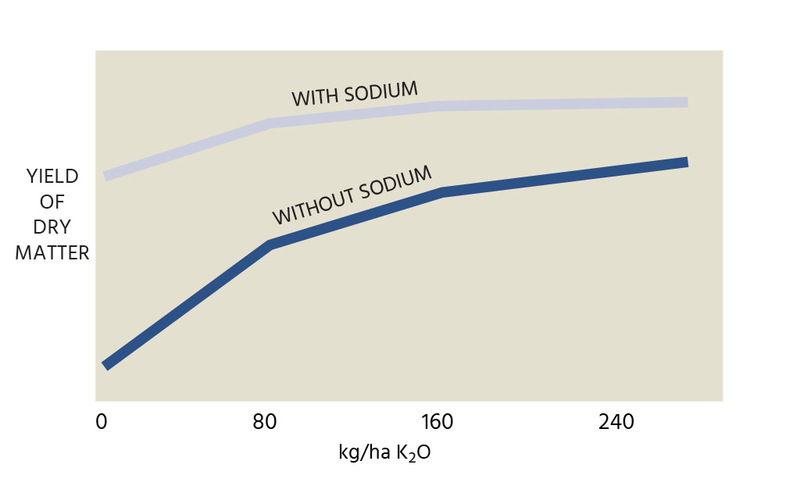 The graph below shows that full yield of fodder beet cannot be achieved with either potash or sodium on their own. In addition to potash and sodium all types of beet have a high requirement for magnesium. Where soil reserves are small, magnesium deficiency symptoms will appear. These destroy part of the vital leaf area with resultant irretrievable loss of yield. Magnesium should be thoroughly incorporated into the plough layer before drilling at soil index 0 or 1. 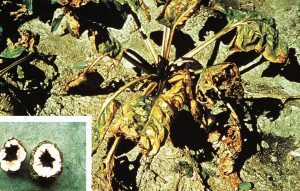 Magnesium deficiency – the margins of middle – aged leaves turn yellow, the edges die and become brittle. Most of the sources of these nutrients are natural minerals. They are mined as crystalline rocks which occur in great abundance throughout many regions of the world. Potassium and sodium are most commonly found together as rock “salt” deposits (Sylvinite and Kainit) resulting from the crystallisation of minerals in sea water after evaporation. Muriate of potash (potassium chloride) is derived by the removal of the sodium chloride from these double salt materials. Potassium sulphate is less common and may be mined in association with magnesium salts or produced from muriate of potash. Pure common salt deposits also provide a source of sodium chloride on its own. Magnesium also occurs naturally as magnesium limestone which is not only a valuable nutrient source but also an efficient liming material. Magnesium carbonate (magnesite) on its own, provides a straight magnesium fertiliser after heat treatment to produce magnesium oxide (calcined magnesite). Chloride and sulphate salts of magnesium are also mined as sources of this nutrient, frequently in combination with potash materials. Nutrient content of the natural mined materials varies slightly but typical contents are given in the table. Nitrogen management is recognised as the most important aspect of nutrition controlling high yields of fodder beet. On a low fertility soil correct use of N can double dry matter yield. Optimum rates of nitrogen depend upon soil type, excess winter rainfall, previous cropping and manuring, and are more fully dealt with elsewhere. E.g. Nutrient Management Guide (RB209) Section 3 Grass and forage crops. 3. In the first week of May apply the balance of the nitrogen requirement to the established crop. A trace of this element is needed to produce a satisfactory crop of fodder beet. Most soils contain sufficient, but alkaline, sandy soils often result in deficient crops. Symptoms are unmistakable – first the growing point dies (usually in late June or July) and turns black. Rot then develops and spreads from the heart to the crown and shoulders. To ensure freedom from deficiency, boron can be incorporated in the fertiliser for soil application. Alternatively a spray in May or early June can be mixed with a herbicide or aphicide application. About 2-3 kg/ha of the element (B) completely prevents symptoms developing. 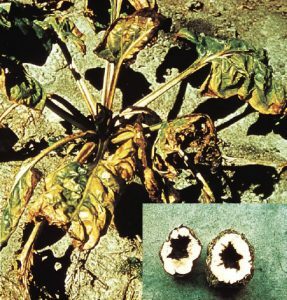 This is the most common trace element deficiency seen on all types of beet. Where uptake is insufficient, yellow spots appear on leaves at any stage of development from seedling to harvest. In severe cases much of the green tissue is permanently damaged with subsequent loss of yield. Soil treatment is not possible because manganese is locked-up by soil organic matter, particularly in alkaline conditions. It is therefore necessary to apply as a foliar spray. Several applications may be necessary to give season long control because the element is not translocated from old to young leaves. Most fodder beet crops receive some manure from the livestock units which they feed and in common with most root crops, they obtain useful improvements in performance as a result. Soils regularly treated with organic manure show better physical characteristics such as ease of seedbed preparation and improved plant emergence and water-holding. Nutrient status is also improved, decreasing fertiliser requirement. Poultry manure and slurries are particularly rich in nutrients. Spring sown fodder crops such as beet provide an excellent opportunity for disposing of slurry and FYM but as with all good things it is possible to apply too much! Estimation of the nutrient content of manure must be made and applications adjusted accordingly. 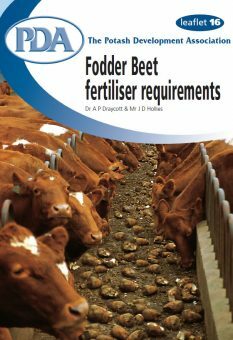 Because of the suitability of particular fields, fodder beet is rarely rotated round the whole farm and whilst this crop has a very large capacity for nutrients it is both wasteful and environmentally undesirable to apply levels of manure that result in nutrient status to build up over index 3. Fertiliser grades should be selected to balance the nutrients provided by manure. For fodder beet, sodium is recommended on all soils except Fen silts and peats. Apply 400 kg/ha of agricultural salt (200 kg Na2O/ha) well before drilling. If sodium is recommended but not applied, increase potash by 100 kg K2O/ha. A boron application may be needed. Soil and plant analysis are useful guides to assess the need for boron. Nutrient contribution from manure must be deducted from these recommendations. The same principles of nutrition apply, but adjust amounts of nutrients to yield. If insufficient manure is available, a suitable fertiliser source must be used. The quality of the seedbed is of great importance to the performance of this crop so every effort must be made to avoid compaction or wheeling damage. Fertiliser application to the seedbed is only recommended where phosphate levels are critical and this is better remedied at an earlier stage. Nitrogen should always be applied after drilling as indicated above. All other major elements plus boron as required are best applied well ahead of seedbed preparation. A complete blend of all nutrients required for each situation can be applied during autumn or winter so that nutrients are thoroughly incorporated with soil during cultivations. Large quantities of nutrients, especially sodium, should not be applied close to drilling as there is a risk of seedling damage especially under dry conditions. Earlier application also helps to spread the workload. On the lightest soils some of the sodium and potash may move down through the soil under high rainfall conditions but the advantages of better distribution in the soil normally outweigh the small losses possible from early application. 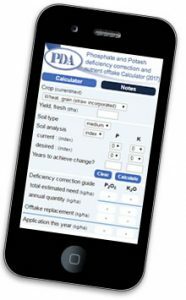 The PDA PK Calculator for arable and forage crops provides a useful means of calculating phosphate and potash requirements for specific situations and provides further guidance on timing (www.pda.org.uk/pda-app/).